Anadolu Efes Istanbul reeled off its third straight win in Group E and its first on the road by beating Brose Baskets Bamberg 76-94 at Stechert Arena on Thursday evening. 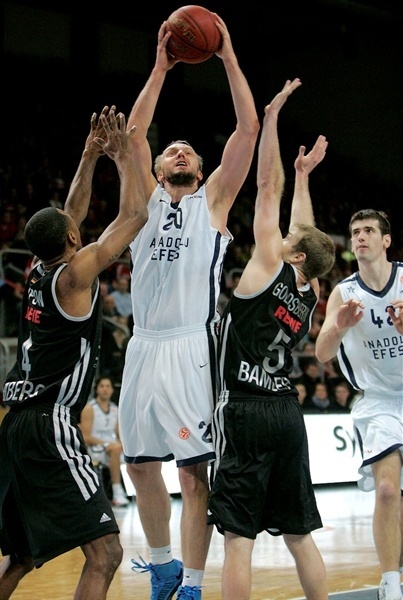 Efes improved to 3-1 and near the top of the group standings. 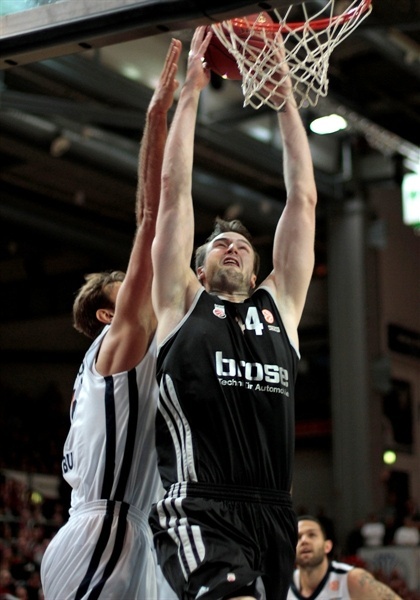 The loss kept Bamberg at the bottom of the group and winless in 10 all-time Last 16 games. The game was closer than the final score might indicate. 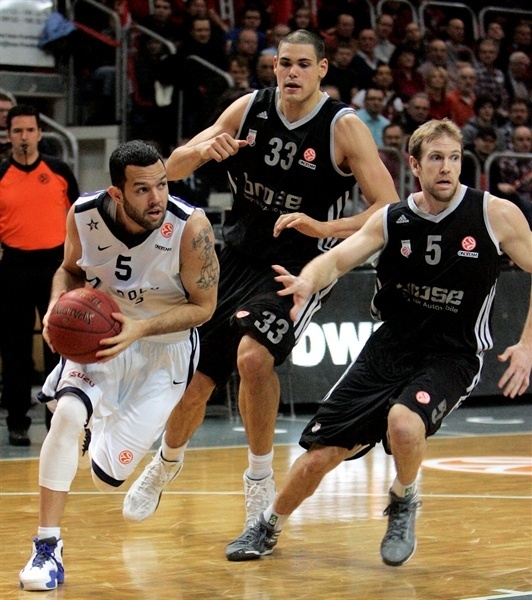 Bamberg dominated early, but Efes rallied to take a 46-47 halftime lead. It was still a 1-point game with three minutes to go in the third quarter, but Efes held the home side scoreless for nearly three-minutes to open the fourth quarter, during which time it scored 7 straight points and amassed a 59-72 lead, from which Bamberg never recovered. Sasha Vujacic led seven Efes scorers in double figures with 17 points, 8 rebounds and 3 steals. 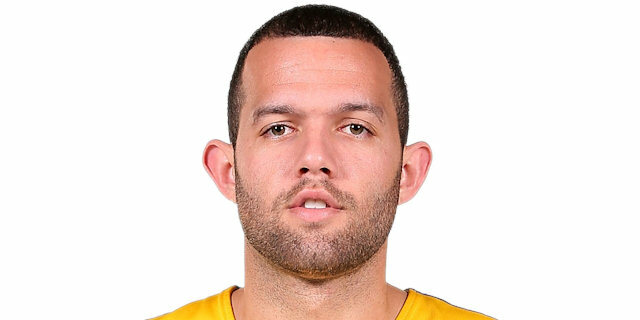 Jordan Farmar tallied 15 points and 7 assists, Dusko Savanovic scored 14, Jamon Lucas 13, Semih Erden 12, Kerem Tunceri 11 and Stanko Barac 10. 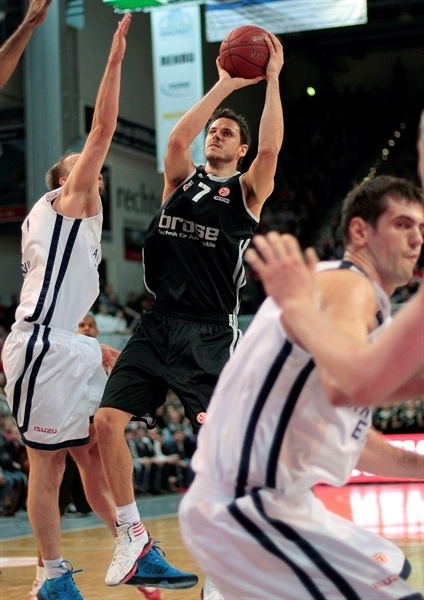 Bostjan Nachbar paced the German champs with 19 points, Teddy Gipson added 16 and Maik Zirbes had 15 in defeat. 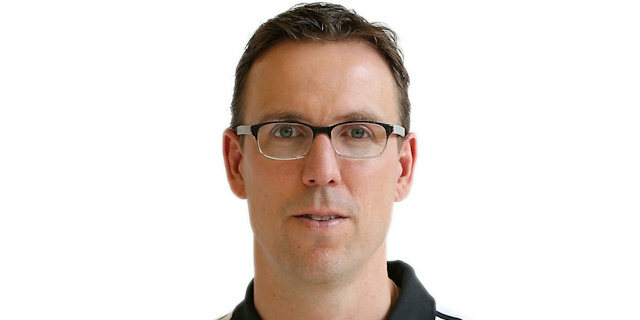 Bamberg coach Chris Fleming sent out the same starting five in John Goldsberry, Casey Jacobsen, Nachbar, Zirbes and Gipson, the latter who was once again filling in for the banged up Anton Gavel. 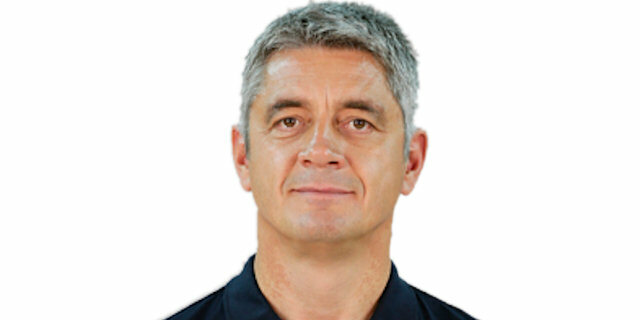 Efes coach Oktay Mahmuti also had his regular starting five in Farmer, Joshua Shipp, Lucas, Savanovic and Erden. Savanovic put Efes on the board first and was matched by Zirbes. Gipson and Farmer swapped three-balls before Savanovic and Zirbes both tallied again for a 7-7 score. Farmer’s triple gave the guests the lead again but Nachbar hit inside and outside before Gipson and Jacobsen both nailed shots from long range to give Bamberg a 17-10 lead. After a TV timeout, Zirbes hit inside to finish a 12-10 run for a 19-10 advantage. Lucas pulled three back on a layup and one but Jacobsen was on target again from long range for a 22-13 game. Savanovic put in an offensive rebound to start a 2-10 run with including a Vujacic jumper and fast break layup after a turnover to pull within 24-23. Gavel nailed a three-ball just before the end of the quarter to give Bamberg a 27-23 lead after 10 minutes. Sharrod Ford opened the second quarter with a triple from the left corner and Nachbar’s two free throws made it 32-26. Vujacic nailed a long ball for Efes’s first score of the quarter. Nachbar hit another jumper and then drained a triple with the shot clock about to expire to push the cushion to 37-28. Barac scored his second basket and then Erden was found down low for an easy dunk before Lucas converted a fastbreak layup after a steal to bring Efes within 39-35, and resulting in a timeout for Bamberg. Kerem Gonlum’s free throws cut the deficit to 39-37 but Bamberg would not break, fending off Erden and Farmer scores to bring it to 43-41. Gipson responded with a tough layup and then made the extra foul shot for a 46-41 lead. Vujacic however hit a triple from the left corner and Farmer knocked down a three-pointer from the right wing for a 46-47 Efes lead at halftime. Nachbar opened the second half with two free throws and the lead went back and forth on a Vujacic putback and a Zirbes dunk, after which Gipson split the defenders for a layup and a 52-49 Bamberg lead. Efes scored the next four points on an Erden basket inside and then Lucas threw down a dunk on a steal after Nachbar had slipped to the floor – giving Istanbul a 52-53 lead going into the TV timeout. Ford put back an offensive rebound and Goldsberry drained a jumper to keep Bamberg within 56-57. But Efes’ guards picked up their play as Farmer made two free throws, Vujacic nailed a jumper and Tunceri converted a layup after a steal as Istanbul pulled out to a 56-63 lead – and a Bamberg timeout. Gavel made two free throws and Zirbes’ foul shot left Bamberg trailing 59-65 after three quarters. Tunceri knocked down a three-pointer from the right side to start the fourth quarter for a 59-68 lead and Fleming did not wait at all, calling a timeout. The talk did not help as Lucas drove to the basket and dunked with the shot clock running down and then Bamberg did not get back on defense and Savanovic hit the fast break layup to make it 59-72 and another Bamberg timeout. Nachbar’s free throw finally put Bamberg on the board with 7:19 remaining – cutting it to 60-72. Erden’s dunk pushed the advantage to 60-74. Bamberg did not go down without a fight as Zirbes scored, Nachbar converted a three-pointy play and Karsten Tadda’s two foul shots trimmed the margin to 67-74 with 5:42 remaining. The Efes guards showed their class again with Vujacic hitting a big three over Nachbar on the right side and Tunceri nailing a triple from the left corner before Erden dunked to make it a 67-82 Istanbul lead. Zirbes answered with a dunk and Nachbar made two foul shots, but Baraca a nd Savanovic came back with two free throws each and the lead was 71-86 with less than three minutes to play. Efes continued to answer every Bamberg attempt as Gipson knocked down a three-ball but Tunceri struck right back with a trey of his own and Savanovic increased the advantage to 74-91 with two foul shots with 1:45 to play to finish all hopes. "Congratulations to our opponents. We did not play the last 22 minutes of the game well enough. We did not play the game to win the game. We played to something else. They were better in every phase of the game in the second half. They weathered the storm in the first half and outplayed us in the second half." 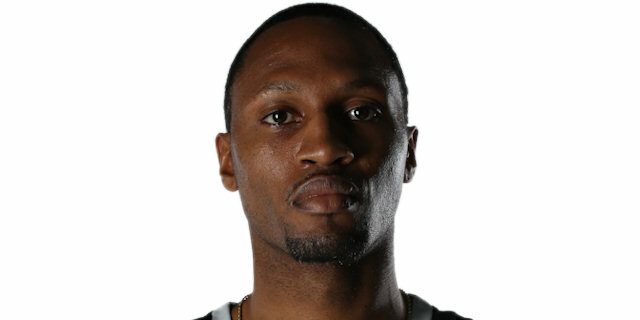 "I think that Bamberg started great with some great three-pointers. We tried to stabilize the game in the second part of the second quarter. We tried to be creative on offense in the second quarter and were able to take the lead. In the end, we took a very important victory against a good team. Every game is a tough game. It’s an important victory. But we have to be able to continue this way and to improve the quality of our way of playing. Every game as a coach you think there is room for improvement." "They executed better in the second half and that was the game. For us, it’s really disappointing. Every loss is disappointing. We thought that we had a chance tonight. We played a great first half, but the second half, the third quarter we kind of let down a little bit and they finished better than we did." "They are a really good team that is well coached. They shot the hell out of the ball in the first half. It’s a good road win for us. We’re just continuing to grow. Everyone is getting used to each other and we’re trying to get better every day and every week and letting that show on the floor. We’re heavy on our guard play, but we have a balanced team and everyone really tried to be aggressive and help the team win."